March 26 - Pampering my calf muscles has been a great time to enjoy a new beverage. A few weeks ago I was sent a CLICK-Start Pack to try. It is an innovative drink that combines gourmet espresso coffee, protein, and great taste into a healthy energy boosting beverage. I've heard other runners talking about the benefits of protein drinks after working out, but being the picky person that I am, I figured I wouldn't like them. But I love coffee, especially flavored coffee. So I tried CLICK and it.is.YUMMY! It is super easy to make. Take some water, add two scoops of CLICK, and shake. I love to use the CLICK shaker cup and then put it in the refrigerator to get it really cold. You can have this drink any time you want. While I've been having it more as a afternoon snack lately, I also had it after some long runs. I'm not a huge fan of milk, so this is an awesome recovery drink for someone like me. You can mix your CLICK with milk, almond, soy, coconut, whatever you fancy! You can find more information on the CLICK website. If you would like to try CLICK you can check out their Facebook welcome page for a Free Sample Offer and fan discount. And take a look at their fan recipe page for some yummy ideas. You can also enter to win your very own CLICK-Start Pack which includes: a canister of CLICK mocha, samples of CLICK vanilla latte, and a CLICK shaker. The giveaway ends March 31 and the winner will be announced on the blog April 1. 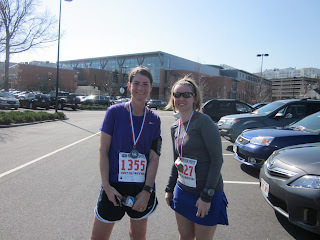 March 24 - Last weekend I ran a half marathon that wasn't planned. I did it because I've been feeling amazing. I did it because I want to maintain my fitness level for the next one that is on my schedule - the Cox Rhode Races Half Marathon. I did it because it was insanely fun to sign up at the last minute, and KNOW that I COULD do it. The week prior my left calf muscles were a bit tight and spasming a little, so I took all the typical precautionary measures: ice, KT Tape, the stick, and foam rolling. 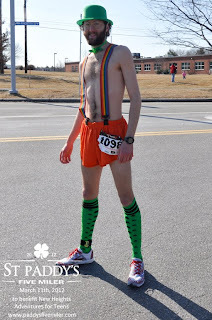 After the race I sported my compression shorts, compression socks, and decided to take a little rest. My legs were tired, but overall I was feeling pretty good. I was thinking I can do half marathons all the time! On Monday, my calf was feeling very, very cranky = tight and tender. Uh oh. 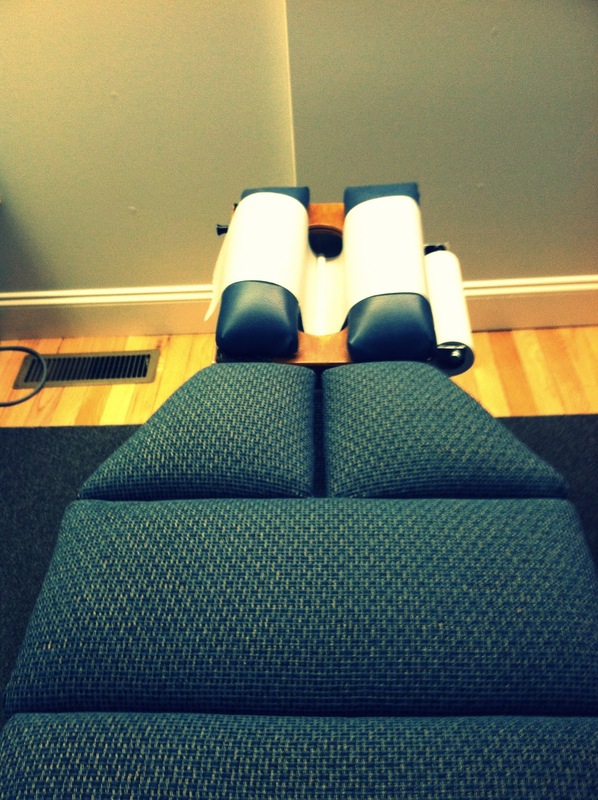 So I continued all of the above, took some ibuprofen and went to see the chiropractor. Mr. Chiropractor adjusted my lower back, my hips, my ankle and my foot. Then he told me You have very little arch in that foot. WHHATT? He explained that my calf muscles were working extra hard because of the lack of support in my foot. So I ordered myself a pair of made-just-for-me orthotics to go with my new pair of Nikes. I skipped my scheduled run on Tuesday because the calf was still feeling ouchy. 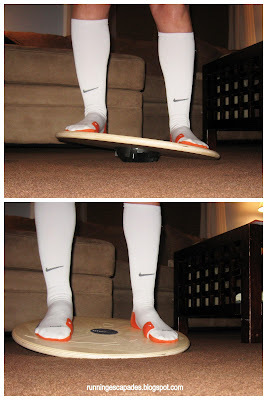 I continued to coddle the calf, even working it out using my wobble board; it's great for stretching and strengthening. On Thursday it was feeling a lot better so I did a short trail run before another visit to Mr. Chiropractor. In addition to a full adjustment, I was told to get a sports massage. So this morning before my appointment I went for a four mile run. I took the dog with me hoping he would prevent me from going too fast. My calf was still feeling a little stiff and I even had to stop to stretch it, but by the end it had loosened up considerably. 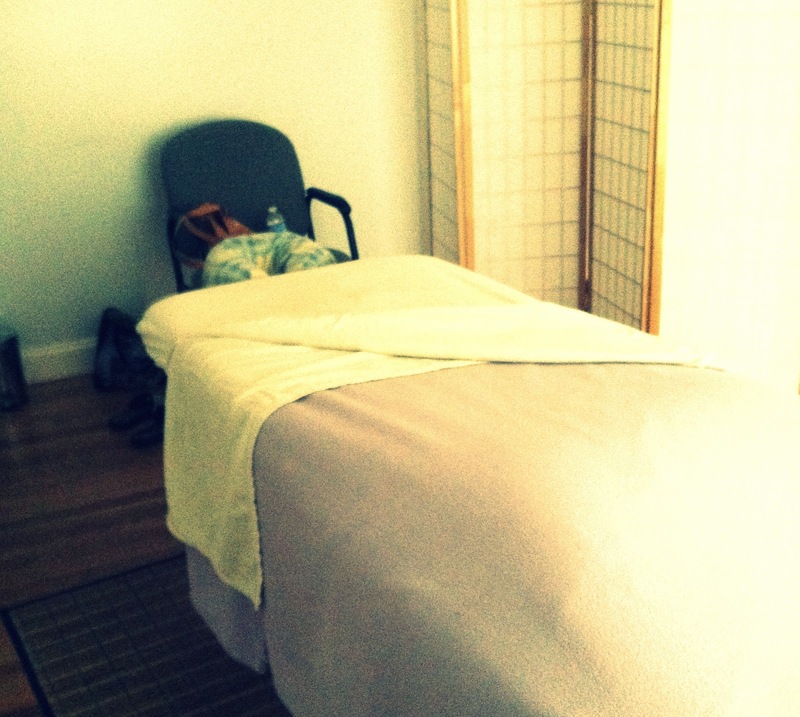 Luckily my massage therapist is also a runner. She worked all the tight muscles in my legs, used hot rocks on my calves, and stretched out my quads and hips. She also suggested that I use heat before stretching and rolling my tense calf muscles with a tennis ball. I am hoping to pick up the made-just-for-me orthotics next week and then put an end to this tight calf business. 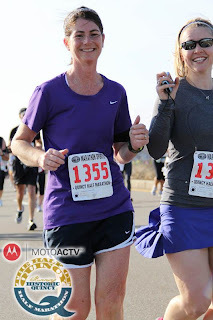 I am looking forward to another season of good running, fun experiences, and another pain-free half marathon! 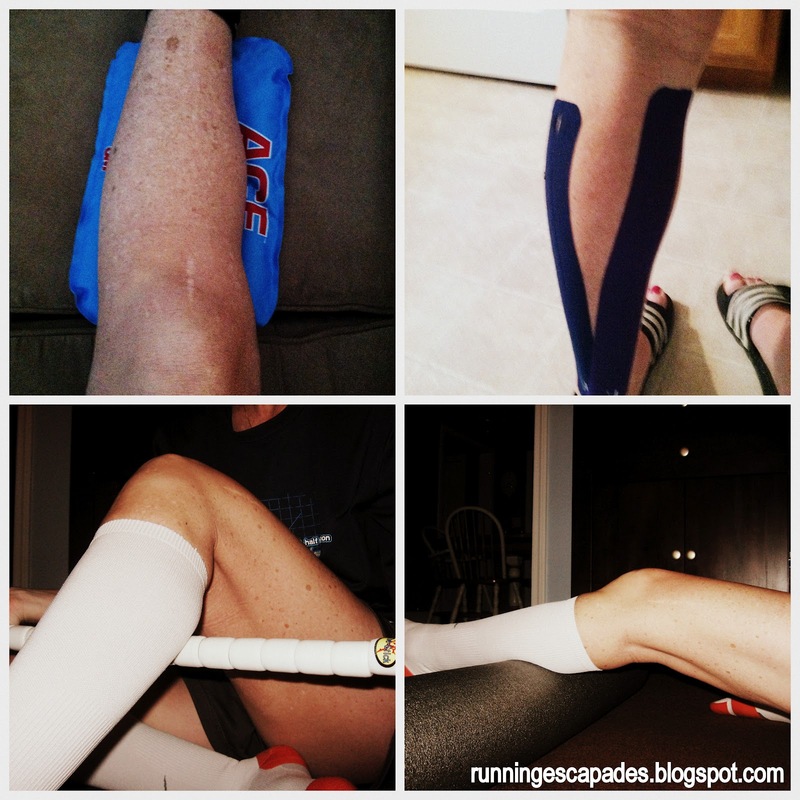 How do you deal with a nagging pain/injury? Do you think custom orthotics work? 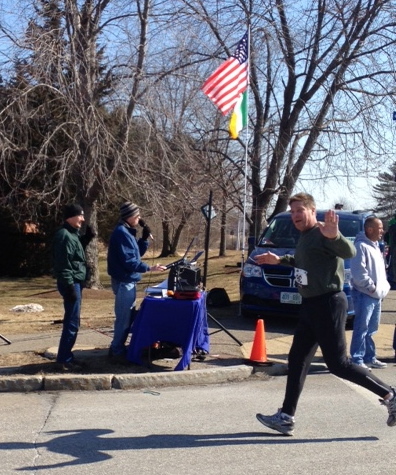 March 19 - Yesterday I ran half marathon #3 in Quincy, Massachusetts. This race wasn't on my schedule until last weekend. My Crazy Running Partner has a goal to do 12 half marathons this year. She told me she was running this one and since hubs is out of town, I thought I'd join her to be her cheering section or maybe do the 5K that they added this year. 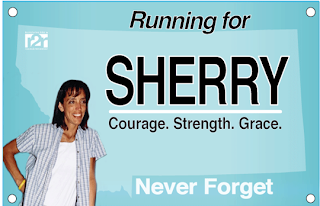 But when I went to the website to register, I found myself thinking...Why shouldn't I run the half? A 5K seems kind of short these days. I'm in the best running shape I've ever ben in. I still have plenty of time to recover before the next one on my schedule. So that's how I ended up running half #3. The race was 90 minutes away from where we live, so it was an early morning. On the way to meet CRP I picked up my stepdaughter who was coming along so that she could catch the train in Boston back to school after the race. She also promised to be the "second best cheerleader" after her dad. So off we went to Quincy High School - the most beautiful high school I have ever seen! I have been teaching for a long time including in a brand new building in Ohio, but this was like visiting a college campus or fancy hospital. Gorgeous. The weather was forecasted to be 45 degrees at the start but climb to over 55 about the time we expected to finish. We opted to dress for the warmth accepting that we would freeze a little waiting at the start. Small sacrifice. 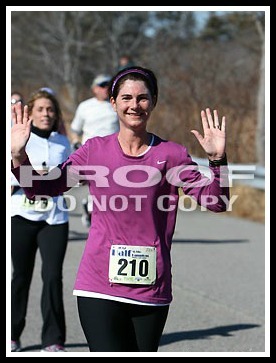 I think it was almost 70 when we crossed the finish line. Pre-race was super organized. The website said "convenient parking behind the school" and except for lack of signage, it was perfect parking for a pretty big race. Bib pick up in the gym was quick and easy and if you were one of the first 500 to register you also got a race shirt. That, of course, was not me. The only restroom we saw had a line (shocker) but it moved quickly and we had plenty of time to head back to the car before making our way to the starting line. A Quincy police officer sang the National Anthem and we were off. The plan for this race was to treat it like a really big fun group run. We weren't going after PR's and had in fact practiced slowing down our pace on a couple of runs during the week. We brought our cameras so that we could stop and take pictures. It was a beautiful course to run. 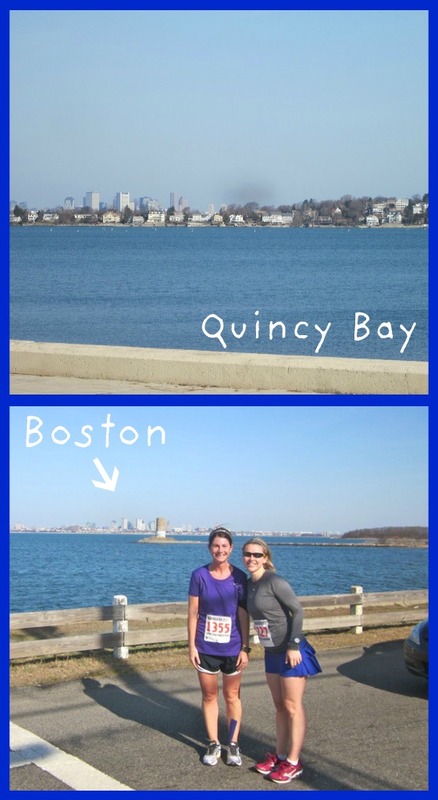 At 1.5 miles we stopped to take some pictures of the incredible views of the Boston skyline across the Quincy Bay. We were lucky enough to have the assistance of a couple of Quincy police officers to snap one with us in it. After that we ran along Wollaston Beach, a two mile stretch of shoreline anchored by a continuous walkway and fine sand. We found more incredible views as we traversed four miles onto the Squantum Peninsula and through the Marina Bay Complex. Although the docks were mostly empty this time of year, the luxury residences that lined the boardwalk were beautiful and had me longing to win the lottery. The remainder of course led us back through the "forgiving" hills of the historic "City of Presidents" and to the finish lined with cheering crowds including the "second best cheerleader" who gave me a high-five as I passed by. At the finish line we were handed our Half of Quincy medals and a bottle of water. Two thumbs up to the race organizers for having the water right there and not making runners walk around searching for it. Also readily available outside were bananas, while inside runners could choose a turkey, tuna, or chicken wrap, along with warm soup. We already made plans to hang around Quincy for lunch so we declined the food but snagged some Vita Coco Coconut Waters. After a quick wardrobe change at the car we set out on foot to grab some lunch. Three iPhone apps, a couple of blocks, and one closed restaurant later, we found ourselves at The Fat Cat and I believe we lucked out. This warm and easygoing establishment had a variety of appealing choices on the menu, was very affordable, and treated us to great customer service. CRP informed us that the restaurant had been featured on Phantom Gourmet and it was easy to see why. The food was delicious. Have you ever run a race unexpectedly? How was it? 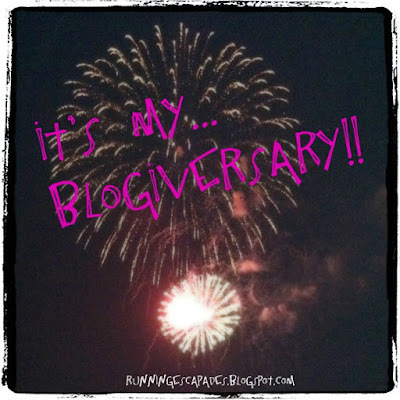 I can't believe I have been blogging for a WHOLE year! Amazing things have happened since I wrote my very first post. now I have pictures and Twitter and Facebook! facing snow storms, pouring rain, BIG hills and more! 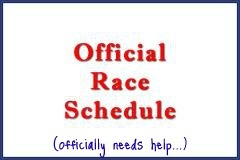 I was also asked to be part of a little adventure and became a 2012 Blogging Ambassador for the Cox Rhode Races. Being one of the voices that runners hear as we train for our races has been an honor and I'm looking forward to race weekend in Providence. The fifth annual race series will be held May 5-6 and will feature a full marathon, half marathon, 5K, and kids fun run. 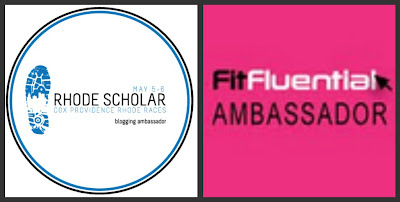 You can hear from all Ambassadors on the Rhode Scholar Blog here. I joined an amazing community of fitness fanatics at FitFluential. This online community is supportive and spreads a positive healthy message. It is open to anyone who is passionate about fitness (not just bloggers either). 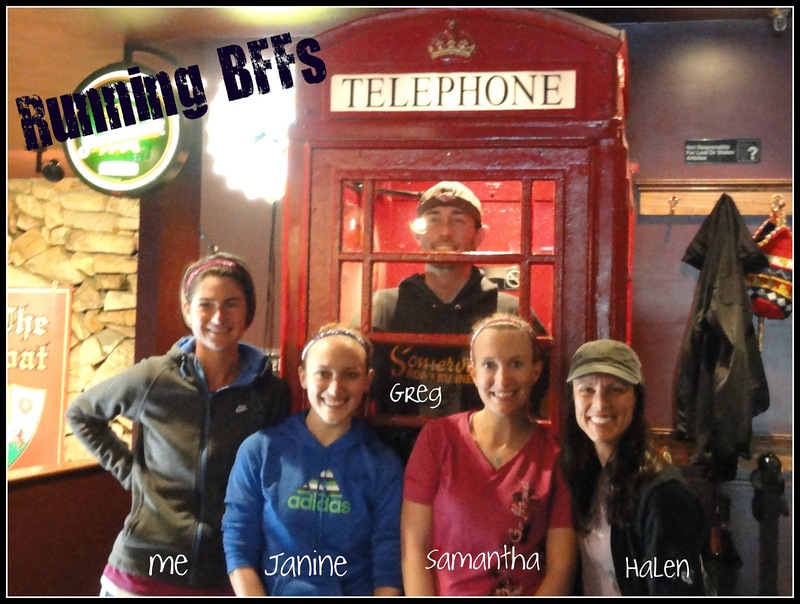 By joining you will find yourself interacting with people who are sharing, talking, living, and breathing fitness. You will hear about great opportunities and get more support than you ever imagined possible. 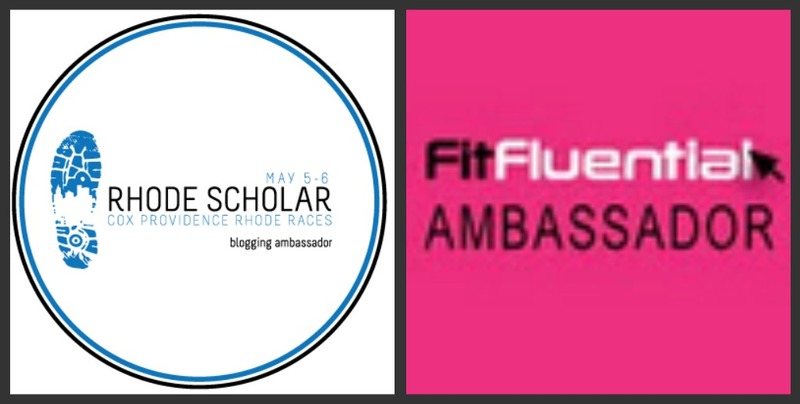 I'm now a FitFluential Ambassador which means I'll also be sharing information about great fitness products, events, and opportunities here on my blog. My blog was nominated for a 2012 Fitterati Blog Award on FitnessMagazine.com! To think that someone out there considers my running blog a source of motivation and inspiration is the biggest compliment I could ever receive. It is pretty cool just to be nominated along with so many AMAZING blogs and know that someone likes reading about my adventures in running. Needless to say, there has been a lot of happy dancing this year. 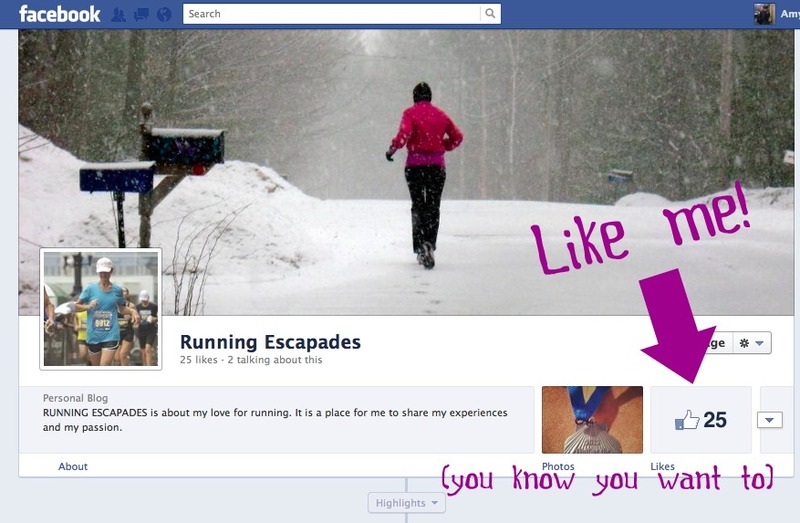 I am excited to continue blogging about my experiences and sharing my passion for running. so much for reading about my escapades! 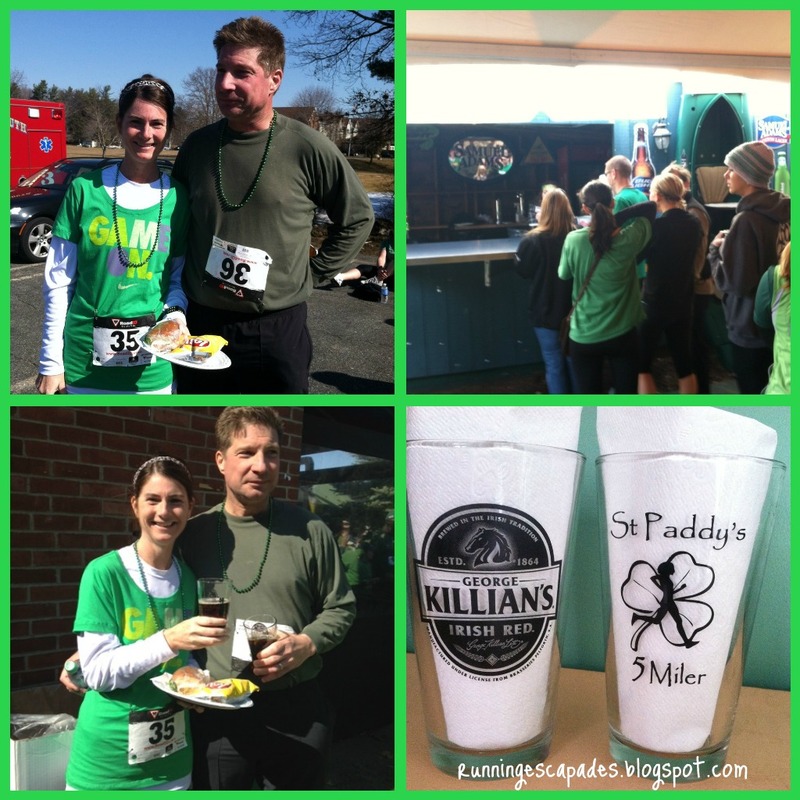 March 12 - Yesterday I ran my first five mile race at the St. Paddy's 5 Miler in Portsmouth, NH. I was lucky enough to have hubs running with me, but even better was that my home-from-college-on-spring-break stepdaughter came to cheer us on. I signed up for this race to use it as another run to maintain my current endurance and stay prepared for my upcoming half marathon. To get into the spirit of the race, we sported the only green shirts we could find. Clearly hubs and I are not very festive when it comes to clothes. Needless to say, we did not win the best spirit awards for the day. We arrived with plenty of time to pick up our bibs, grab our race t-shirts and use the restrooms. Even though it was a bright sunny morning, the temps were still pretty chilly and the wind was downright cold. We opted to wait in the car before heading over to the start where we were surrounded by people dressed in all kinds of crazy green costumes, bagpipe players, and cheering spectators. The race started with the typical cluster-chaos of mixed up running paces. Since I run these things for fun I don't try to get to the front, but it does get somewhat frustrating when you are a half mile in and you are dodging people who are walking. I stayed with hubs for about a half mile, but then moved off on my own. About two miles in I came up behind a group of women who were running a nice comfortable pace and decided to stalk trail them. 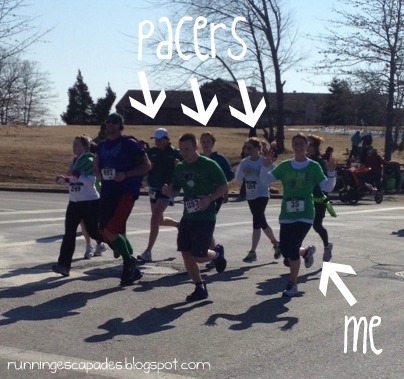 They became my unofficial pacers for the day. For the next three miles I ran behind this group as they chatted about people they knew, trips they were taking, and long runs they had on schedule. The next thing I knew we were approaching the finish. At the corner I saw my stepdaughter waving which gave me a big burst of energy and I ended up passing my unofficial pacers. 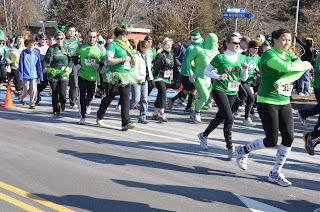 After crossing the finish line, I was handed a cute green beaded necklace and a beer ticket. I quickly made my way to the post race fuel tent, grabbed two waters and then made my way over to my stepdaughter to watch for hubs. 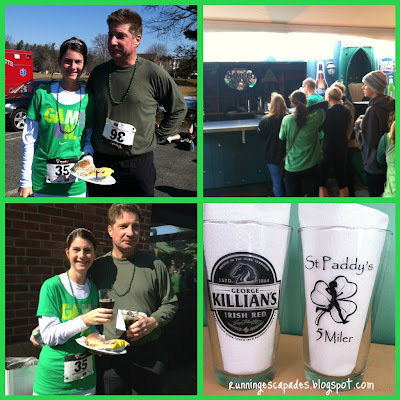 After grabbing some of the amazing post race refueling food (hot vegetable soup, subs, and chips) from the tent, we walked over to the beer garden at Paddy's American Grille to grab our post run beers and official Paddy's Five Miler race glasses. We had a blast at this event. What made it even better was knowing that all proceeds from the race go to New Heights, a non-profit organization that promotes healthy lifestyles and activities through after school and summer programs for Seacoast youths age 11-18. 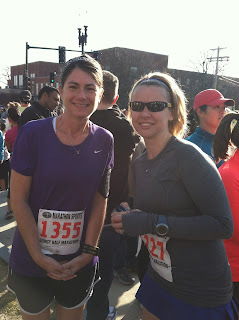 March 5 - Sunday morning I left my house at 5:30 to meet Daisy for a ride to The Black Cat 10 - 20 Miler in Salem, MA. 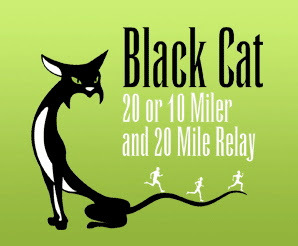 This race offered runners the option of running 10 miles, 20 miles or participating in a 20 mile relay. The course, touted as mostly fast & flat, started at Salem Willows, wound through downtown Salem into Marblehead and turned-around at Devereux Beach. The race was created in 2010 to attract runners training for the Boston Marathon and others ready to lace up their sneakers from the winter. 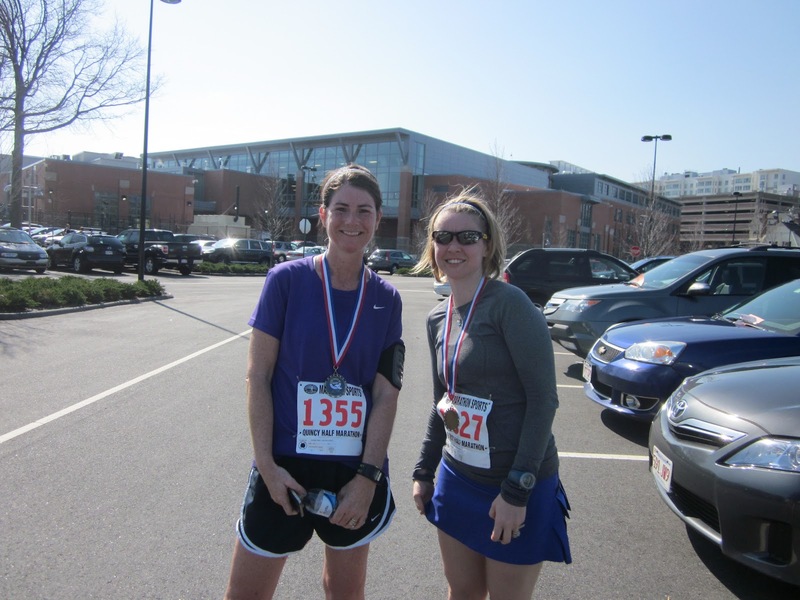 For me, it was a great distance for maintaining my endurance for my next half marathon. Salem is a town most widely known for the witch trials of 1692. You may have read about them in The Crucible by Arthur Miller when you were in high school. It is also the birthplace of Nathaniel Hawthorne, another famous New England novelist you may have read who wrote The Scarlet Letter and The House of Seven Gables. Salem is also rich in its maritime heritage, offers a splendid array of historic architecture, and is popular for its quirky Halloween themed attractions. 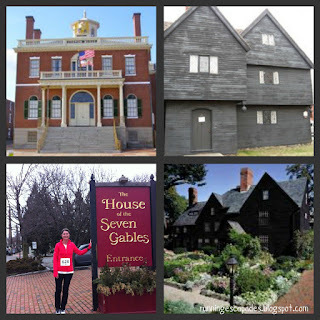 Popular points of interest include the Friendship of Salem (a replica sailing vessel), Derby Wharf and Light Station, Custom House, House of Seven Gables, New England Pirate Museum, and Salem Witch Trial Museum. The 10 mile race was challenging. The course was much hillier than I anticipated, but because Salem State is nearby many sororities and fraternities set up water and Gatorade stations as part of their community service projects. There were times when the runners and traffic were crowded together on the road, but in other places the local police and volunteers were present to give direction. At the finish line runners were handed finishers medals and directed to water, Gatorade, post race snacks, as well as stretching and massages in the school gym. This was a fun race and I would do it again. This new and locally organized event was a success. 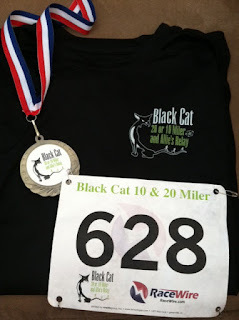 The 10 Miler had 664 finishers, the 20 Miler had 327 finishers, and the Relay had 18 teams finish. And although we didn't attend, there was a post race party at FINZ Seafood & Waterfront Restaurant where for $10 runners were treated to a variety of post race food, cash bar, free samples of Barefoot Wines, raffles and entertainment. This race also supported a worthy cause called the Allie Castner Scholarship Fund. Allie was hit by a car and killed in 2009 when she was only 15 years old. The scholarship in her memory provides other young high school students the opportunity to benefit. Take a moment to read her story and the many ways you can contribute to the fund.